EazyDraw Retro, version 9.0.2, is provided as a full solution for AppleWorks and the other classic drawing formats. EazyDraw Retro runs fine on Mojave and all older versions of OS X back to 10.4.11 . Use it to open AppleWorks (MacDraw, MacDrawII, MacDrawPro, ClarisDraw) drawings directly on macOS 10.14. Save the drawings to EazyDraw graphic format for use by all other versions of EazyDraw. EazyDraw Support has a download link and more information. EazyDraw Retro runs on OS X 10.4.x and newer, including Mountain Lion. EazyDraw is a modern OS X Cocoa applications, so it works as a full fledged team player with the Apple or Microsoft office productivity Apps, Keynote, Pages, Numbers and Microsoft Office, . 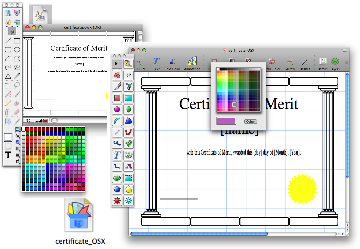 EazyDraw can even export native Keynote XML graphic files. Check our Dream Workflow web page for more information. All the shapes in your AppleWorks drawing are turned into the EazyDraw equivalent. Rectangles become rectangles, even a rotated elliptic arc will become an EazyDraw rotated elliptic arc. Check out the video tutorial at the bottom of the EazyDraw Support page for demonstration. The EazyDraw Support Page has a video tutorial that takes you quickly through the steps to open your AppleWorks drawings on OS X Lion. EazyDraw Retro provides a solution to recover AppleWorks, PICT, MacDraw, and ClarisDraw drawings (even those saved on OS 9) OS X versions 10.4.3 and newer.